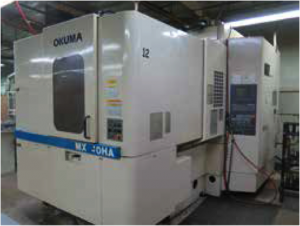 Nakamura-Tome Methods Slant SR. CNC Turning Center s/n A30701 w/ Fanuc Controls, 10-Station Turret, Hydraulic Tailstock, Parts Catcher, Turbo Chip Conveyor, 10” 3-Jaw Power Chuck, 10” 4-Jaw Power Chuck, S-26 Collet Pad Nose, LNS Hydrobar 6-Tube Hydraulic Bar Feed, Coolant. Mori Seiki SL-1 CNC Turning Center s/n 271 w/ Yasnac Controls, 8-Station Turret, Hydraulic Tailstock, 6 ½” 3-Jaw Power Chuck, Coolant. Hardinge CHNC II+ CNC Chucker s/n CN-2282-A2-116 w/ Fanuc GN10 Controls, 8-Station Turret, 16C Spindle, Turbo Chip Conveyor, Coolant. Hardinge CHNC II CNC Chucker s/n CN-4248-F w/ Fanuc GN10 Controls, 8-Station Turret, 16C Spindle, Cutoff Attachment, Coolant, LNS Hydrobar 6-Tube Hydraulic Bar Feed s/n 29.710. Hardinge CHNC CNC Chucker s/n CNC-9950A2-16 w/ Fanuc GN10 Controls, 8-Station Turret, 16C Spindle, Cutoff Attachment, Part Chute, Bar Feed, Coolant. (2)Hardinge CHNC CNC Chuckers s/n’s CCA-1222-2-5C, CNC-531-R w/ Allen Bradley CNC Controls, 8-Station Turret, 5C Pneumatic Collet Closer, Cutoff Attachment, Parts Chute, Bar Feed, Coolant. Agie Agiecut Sprint CNC Wire EDM Machine s/n 009 w/ Agie Agiematic CD CNC Controls, Agie RC123 Hand Controller, AgiePULS-HCM Power Source, Agie DA-18 Filtration System, Remcor Cooling System. Agie Agiecut Type DEM-315 CNC Wire EDM Machine s/n 69 w/ Agietron CNC Controls, System 3R Tooling Fixturing System, Fast-Track Coolant System, 13 ¼” x 22” Table. Agie Agiecut Type DEM-315 CNC Wire EDM Machine s/n 109 w/ Agietron CNC Controls, Agie MS/3 Power Source, T-Star Coolant System, 13 ¼” x 22” Table. (5)Agie Agiecut 100 CNC Wire EDM Machines s/n’s AC100/87, 104, 59, 31, 16 w/ Agiematic-C Controls, Agie RC123 Hand Controller, AgiePULS MM Power Source, Filtration System Agie Agiecut 100 CNC Wire EDM Machine s/n 5 w/ Agiematic-C Controls, Agie RC123 Hand Controller, Agie MID Power Source, Filtration System. 1993 Charmilles Roboform 20 CNC Die Sinker EDM Machine s/n 210094 w/ Charmilles CN Controls, Hand Pendant, System 3R 4-Station Tool Changer, 11 ¾” x 15 ¾” Work Area, Coolant Filtration System. Generator, 8” x 5” Travels, Lista 5-Drawer Maple Top Work Bench. Okamoto Accugar-124N 12” x 24” Automatic Surface Grinder s/n 6443 w/ Okamoto Controls, Electromagnetic Chuck, Wheel Dresser, Coolant. Okamoto mdl. IGM-1E Automatic ID Grinder s/n IGM-1E-NO1423 w/ Okamoto Controls, 4” 3-Jaw Power Chuck, ID Grinding Head, Wheel Dresser, Coolant. Struder mdl. S20 6” x 12” Cylindrical / ID Grinder s/n 399.16 w/ Motorized Work Head, Center, 35,000 RPM ID Grinding Head, Coolant. Jones – Shipman mdl. 540AP 6” x 18” Automatic Surface Grinder s/n BO-98855 w/Electromagnetic Chuck, Coolant. Jones – Shipman mdl. 540AP 6” x 18” Automatic Surface Grinder s/n BO-98813 w/Magnetic Chuck, Coolant. (5)Crystal Lakes 6” Cylindrical Grinders s/n’s 608-4701, 608-2701, 507-2402, 01423, NA. (2)Landis mdl. 4-H Plain 4” x 18” Cylindrical Grinders s/n’s 651-17, 511-2. Landis mdl. 4-H Plain 4” x 12” Cylindrical Grinder s/n 27290. Landis mdl. 4-H Plain 4” x 10” Cylindrical Grinder s/n NA. Harig Super 618 6” x 18” Automatic Surface Grinder w/ Electromagnetic Chuck, Wheel Dresser, Coolant. Harig 6” x 18” Automatic Surface Grinder w/Magnetic Chuck, Coolant. Boyar Schultz Challenger Deluxe 6” x 18” Surface Grinder s/n C-645 w/ Magnetic Chuck. Boyar Schultz 6” x 12” Automatic Surface Grinder s/n HY-5458 w/ Electromagnetic Chuck. Boyar Schultz 6” x 12” Surface Grinder s/n 19036 w/ Electromagnetic Chuck. Sunnen mdl. MBB-1660 Honing Machine s/n 81395 w/ 12-Speeds, Coolant. (3)Sunnen mdl. MBB-1600 Honing Machines s/n’s 44433, 43672, 43163 w/ 12-Speeds, Coolant. Crane Lapmaster 36 Lapping Machine s/n C35129. Crane Lapmaster 24 Lapping Machine s/n A25048. Optima Precision Optical Drill Sharpener s/n B187.068 w/ Tooling. Cuttermaster mdl. FCG-30 Tool Grinder.